Oktovianus Warnares, a prisoner of conscience who has served more than two thirds of his prison term, is eligible for parole. His sentence reduction, an otherwise automatic arrangement, was denied on the grounds that Oktovianus Warnares has to first declare on paper his allegiance to the state of Indonesia according to Government Regulation No. 99/2012. Oktovianus Warnares, along with five other Papuan political activists, organised on 1 May 2013 a flag-raising ceremony of the Morning Star, a symbol forbidden under the Government Regulation No. 77/2007. The event was held in the vicinity of a government building in Biak Numfor, Papua province to commemorate the 50th anniversary of the handover of Papua to the Indonesian government by the United Nations Temporary Executive Authority (UNTEA). 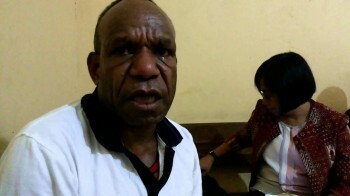 On 10 February 2014, the Biak District Court convicted Oktovianus Warnares and the other Papuan activists guilty of all charges and sentenced him to three years’ imprisonment. Following the appeal process, the sentence has twice been extended; the Jayapura High Court increased the sentence into five years’ and then on 26 August 2014 the Supreme Court ruled his sentence to be seven years’ imprisonment. The other five activists have all since been released. Stop evoking vague and overbroad legislation to arrest, prosecute and punish persons for peacefully exercising their human rights. Also send copies to diplomatic representatives accredited to your country! Indonesia enshrines guarantees to freedom of expression and peaceful assembly in its Constitution and national legislation. But legislation continues to be used to criminalize peaceful political activities and to imprison people solely for the peaceful exercise of their rights to freedom of expression and opinion, peaceful assembly conscience and religion. Article 6 of Government Regulation No. 77/2007 which prohibits the display of separatist logo or flags, and Articles 106 and 110 of the Criminal Code which prescribes a heavy punishment for “rebellion” (makar) with the maximum punishment of life imprisonment have been used to criminalize peaceful activism beyond the legitimate restriction on freedom of expression and association as set out in Article 19 of the International Covenant on Civil and Political Rights (ICCPR) to which Indonesia is a State Party. Amnesty International takes no position whatsoever on the political status of any province of Indonesia, including calls for independence. However, the organization believes that the right to freedom of expression includes the right to peacefully advocate referendums, independence or other political solutions.